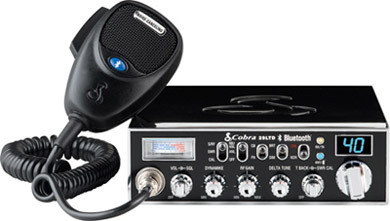 Cobra is giving professional drivers one more way to communicate safely and easily with the first-ever CB radio with Bluetooth technology -- the new 29 LTD BT. The Bluetooth feature allows drivers a better way to have phone conversations on the road because calls from a mobile phone are synched with the CB radio. A noise canceling microphone allows calls to be heard loud and clear, even over a noisy engine. Incoming audio is routed through the radio's 5-Watt CB speaker making it easy for the driver to hear the caller. The unit also provides one-touch Bluetooth operation, giving drivers the ability to stay focused on the road by answering and terminating calls with the push of one button. An auto-redial feature also allows for one-touch redialing of the last number called. The new unit offers 4 Watts AM RF power output, the maximum amount of power allowed by law; Talk Back controls allowing drivers to adjust the desired amount of modulation talk back; a Blue Channel indicator displaying channel selection in cool blue illumination; and Delta Tune which is used to clarify incoming signals. The 29 LTD BT is redefining the CB radio! Instant Channel 9 Instant access to emergency channel 9. Blue Channel Indicator Displays channel selection in cool blue illumination. Bluetooth Wireless Technology Allows you to make and receive phone calls through the CB radio with most Bluetooth phones. One-Touch Bluetooth Operation Allows answering and terminating call with a push of a button. Loud and Clear Incoming Audio Phone calls are heard through the 5 watt CB speaker. Noise Canceling Microphone Allows crystal clear communication in a noisy environment. Auto Redial One-touch redial of last phone number dialed.